Our next meeting will be held on Saturday 15 July, from 11am in Kerikeri (refreshments available from 10.30am). Venue to be advised. The Tale of Prince, written by Bianca Staines, has won second prize in the Animal/Pets category of the US Purple Dragonfly Children’s Book Awards. Rae Roadley is writing a regular column titled ‘What’s in a name?’ for Scene Magazine. Rae will research and write about the history and meanings associated with names within and around Whangarei city. Emily Glew launched her children’s book, I Love Swimming, in Kaikohe in June. Wendy Megget has had an article, ‘Pets on Weeding Detail’, published in the July edition of Kiwi Gardener. Michael Botur will launch his new book, Lowlife: Short stories, on July 12 at The Old Stone Butter Factory from 7pm. All welcome. The evening will include lowlife-themed poetry. See the book launch event page for more information. 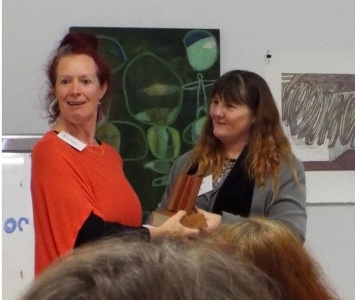 Vivian Thonger was awarded the NZSA Northland Branch trophy for best Northland story in the NFFD competition, for her micro entry, Sick Day. Iris was a founder member of the Northland branch of NZSA(PEN Inc.) Over the years she organised our Dargaville meetings, always made sure there was wonderful food for us on arrival, and attended meetings that were reasonably close to her home – like the Broadwood meeting in March 1997, which is when I first met her. Iris was a good writer. She wrote mainly poetry for pleasure, and for years she worked as a proof reader for the The Northland Times. One of her prose pieces was published in Tandem Press’s book of 50 word stories, edited by Brian Edwards. Iris was also involved in the Northern Wairoa Writers Group and helped with the production of their book Thoughtwaves, where her poetry was published. In 1999 she won the consolation prize in the NZ Women’s Weekly writing competition. 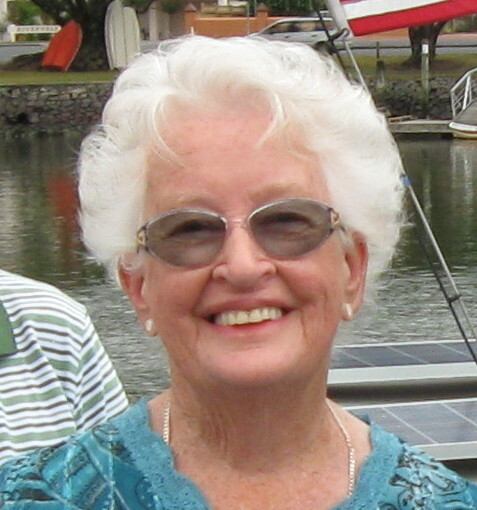 Iris continued to be published but her main joy in life were her grandchildren. My last memories of Iris will be sitting around the fire chatting in the Commercial Hotel at Dargaville on the weekend of our writers retreat (21 July 2012). Iris will be remembered for her warm, friendly nature, her wonderful smile and her witty repartee. This month’s featured book is Lowlife: Short stories by Michael Botur. Head to NZShortStories.com and find the story ‘The Kurt Shirt.’ In the story, what is the valuable vinyl record the character Sage is obsessed with? In the story ‘Unfrozen,’ what is the name of the teacher who the narrator dates? We had a very successful NorthWrite 2017 with 23 people attending the workshop. Vivian led a fun session that encouraged people to explore creativity outside their comfort zones. This was followed by readings of Northland and National flash fiction. More photos are available on the Writers Up North website. The Northland Branch 21st Anniversary will be held on Saturday, 2 December 2017 in Whangarei. We will let you know the details closer to the time. Dirty Word Poetry will be held at The Old Stone Butter Factory, Whangarei, on Wednesday, 12 July from 7 –10 pm, in conjunction with Michael Botur’s book launch. Poets at ONEONESIX will be held at 116 Bank Street, Whangarei, on Thursday, 20 July at 5pm. Gold coin door entry. The August event will be on Thursday 17 August. 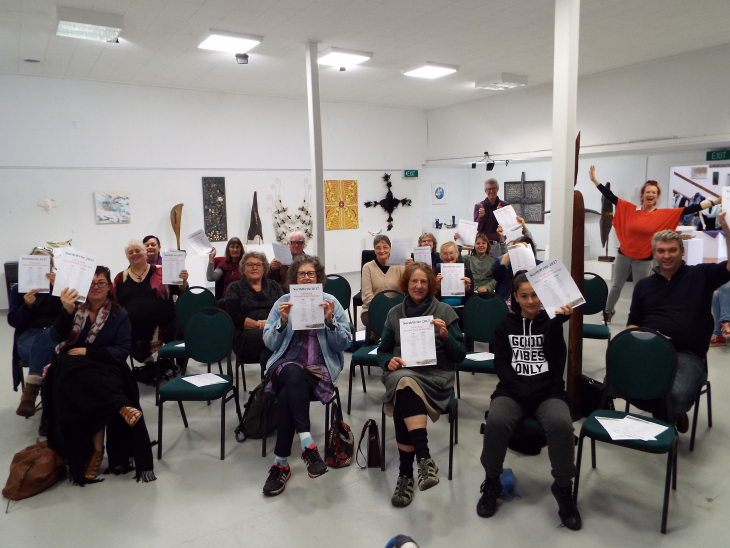 National Poetry Day will be held at Kings Theatre Creative, Kawakawa, on Sunday 27 August from 1.30 – 4pm. This will include the launch of Fast Fibres Poetry Four and an open mic. Entry by koha. The 24th RWNZ Conference will be held in Rotorua from Friday 18th to Sunday 20th August 2017. And we are delighted to be able to offer a special discounted rate for NZSA members. NZSA discount coupon codes were sent out in an email to members in June. If you did not receive them, please email northlandauthors[at]gmail[dot]com for a copy of the codes. Takahē is currently accepting entries for its poetry competition to be judged by Elizabeth Smither. Unpublished poems of up to 50 lines long on any theme will be accepted. Entry Fee: $5 per poem. More details are available at www.takahe.org.nz. The Birdcatcher Books third annual Short Story Competition is open only to Australian and New Zealand writers. Prizes are first $AU250, second $AU100, and third $AU50. The best entries will be published in an anthology. All entrants will receive a free digital copy of the anthology, and those whose stories are included in the anthology will be able to buy print copies at a greatly reduced price. Entry fees are $AU8 for one story, $AU15 for two stories, $AU21 for three stories. For details and the entry form, go to http://birdcatcherbooks.com. Please contact Kathy or Di if you have any announcements, items of interest or achievements you would included in this monthly newsletter.